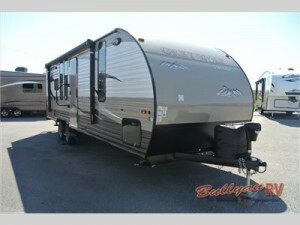 There are so many wonderful options in the Forest River Cherokee Grey Wolf travel trailer. 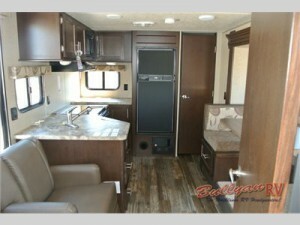 With room to sleep 4 and a slide for extra space, you will feel right at home in the Greywolf travel trailer. The Grey Wolf is affordable, but without sacrificing comfort, style or utility. Explore in the Forest River Cherokee Grey Wolf travel trailer. Step into the Cherokee Grey Wolf travel trailer and be amazed. There is nothing missing from the interior of this RV. Starting in the kitchen you will find a double kitchen sink, three burner range, and microwave. No worries about storage in this space! There is a refrigerator, large pantry and extra counter space for meal prep. Along the other side of the trailer you will find a dinette that is u-shaped and an entertainment center for evening relaxation time. The bedroom has a comfy queen size bed for a good nights sleep or a great nap. There are night stands and wardrobes on each side of the bed for convenience and storage. Wander over to the walk through bathroom. The toilet is in a separate space on one side and the neo-angle shower and vanity are on the other. Plenty of space to clean up after a day in the great outdoors. With enough storage for all of your favorite travel items and all the comforts of home, the Forest River Cherokee Grey Wolf travel trailer is ready to take you on your next great adventure. Contact us today to get started!